Thomas Witt, originally from Detmold, Germany, became a certified Instructor in 2006, having already enjoyed an extensive career with horses from eight years of age. After studying at Gestut Fahrhof in Germany and graduating in 2004 with a ‘German degree in Horse Breeding and Husbandry’ Thommy spent two months at Flag Is Up Farms learning Monty’s concepts. He then returned to Europe to work for Newsells Park Stud, one of the largest Thoroughbred breeding farms in England. There he used the Join-Up® methods to help start the youngsters. Thommy returned to Flag Is Up Farm in January 2006 to complete his training and become certified as a Monty Roberts Master Instructor. 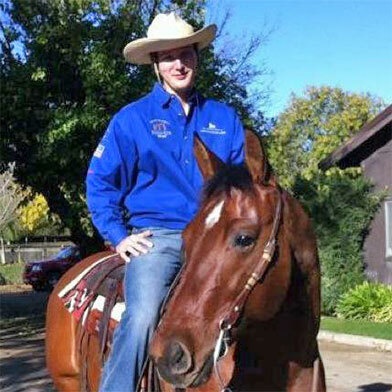 He then went on to teach at the Monty Roberts International Learning Center for three years and has recently moved back to Germany where he continues to work with horses and share Monty’s concepts. 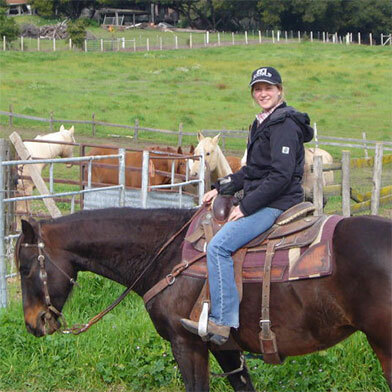 Denise discovered her passion for horses at a very early age and started riding when she was five years old. She got her own horse when she was thirteen and still owns him now. After completing a school for foreign languages and interpretation, she went traveling and spent time learning from different Western trainers in Canada, Austria and Germany. 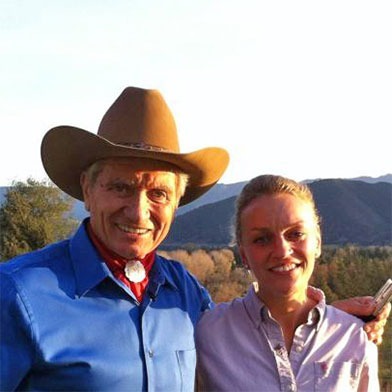 Since 2006 Denise has followed Monty Roberts’ methods and has been working and learning from Monty himself in addition to various Monty Roberts Certified Instructors at the Monty Roberts International Learning Center (MRILC) and in Germany, Portugal, Netherlands and England. Denise has been a member of Monty’s German Tour team since 2008 where she is involved in the horse selection and Join-Up® presentations. In November 2009 Denise realized her goal of becoming a Certified Instructor of Monty’s methods and is now spreading the concepts of Monty’s non-violent approach. 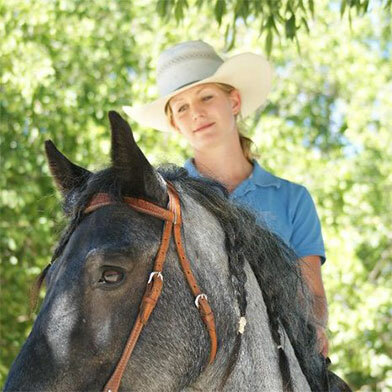 After teaching classes and courses in Germany and gaining a lot of experience in the Thoroughbred industry, she went to teach at the Monty Roberts International Learning Center in California. 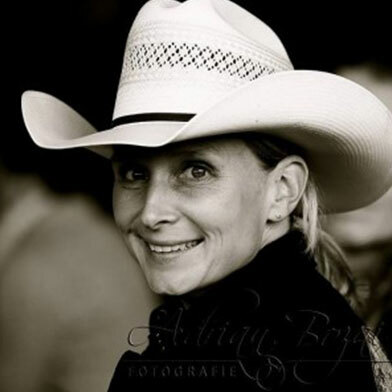 Denise is a member of Monty Roberts Instructors Committee. After her time as Resident Instructor at the MRILC, Denise traveled to Argentina and India to share her knowledge of horse behavior with the Polo World and hold the first Monty Roberts Course in Asia. She is located in Bavaria, Germany. Susanne ist spezialisiert auf das Reiten problematischer Pferde und das Anreiten junger Pferde. Zusammen mit ihrem Partner Luuk Teunissen bietet sie Einzelcoaching und Monty Roberts Kurse in Deutschland und Holland an. Luuk became a certified instructor in 2011. He grew up with horses in the Netherlands in a family that has been around horses for generations. At the age of eight he started riding and gained experience in various disciplines ever since. Luuk studied at the University of Applied Science in Den Bosch in the Netherlands. In this period he worked on many projects involving animal welfare, horse behavior and training principles. He wrote several articles with a scientific background that were published in Holland. In 2011 he graduated. Between 2007 and 2011 Luuk worked for several Monty Roberts instructors around Europe to learn more about Monty’s concepts. He also got the chance to train with Monty himself. He gained experience staying in England for six months, where he was taught by Dan Wilson, a specialist in the training of horses with behavior problems of all kinds. Dan Wilson has also been Monty’s rider on tours for over ten years. 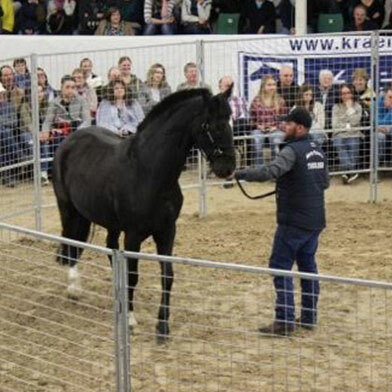 Luuk has worked on demonstrations and tours for Monty in Germany, Austria, Switzerland and Holland. Together with his partner Susanne Suberg he works in Holland and Germany offering horse training, events and Monty Roberts courses. Nina was born in a family closely connected to horses. Her grandfather was an instructor for cavalry horses, her parents are into horses as well. Unsurprisingly she started riding when she was very young – even before starting to walk. Ever since her life has revolved around horses and the decision was made quite early to turn interest into profession. Monty’s concepts led her from Germany to France, Portugal and finally to the MRILC in California, where she graduated as an Instructor in 2011. Additionally she started studying human resource management in 2009, hoping to transfer the insights from both studies into each other. Today you can find Nina in Dortmund, Germany, where she is running a horse instruction business, focused on loading and transport. For further information please visit her website. Franziska grew up in a horse family. Her grandmother breeds Holsteiner Warmblood Horses. 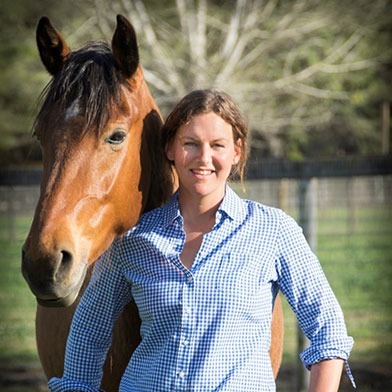 As a child, Franziska trained in dressage and show jumping but soon she discovered that the traditional approach in handling, riding and training horses was no longer what she wanted to be part of. That was when she read her first book by Monty Roberts “From My Hands To Yours” and when she knew that one day she would be going to America to learn Monty’s methods. After graduating as a lawyer in 2006, she started to make that dream come true and began her training with a Certified Instructor in Germany for three years. 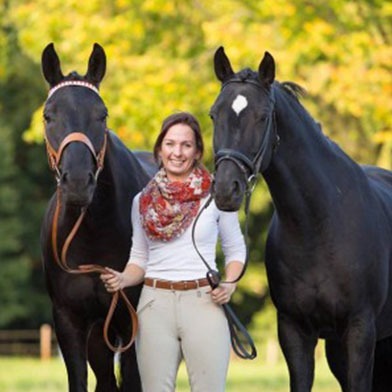 Since 2009 she runs her own horse business in Germany training and starting young horses, training remedial horses and working with young dressage and show jumping horses on big stud farms. In 2010 she began traveling to the MRILC on Flag Is Up Farms and became a Certified Instructor in 2012. 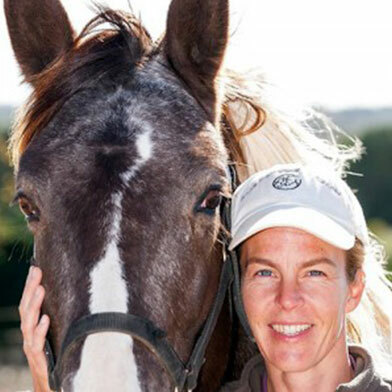 Now besides training horses and coaching horse owners all over Germany, Franziska is a member of the Instructors Committee and she offers Monty Roberts Courses. Horses have been her passion since she was a little girl. She took her first riding lessons at the age of five and she was only 12 when she got her first horse. This mare wasn’t the easiest – This horse taught her that trust and willingness only can only be achieved when communication in a shared language takes place. The connection with Monty’s methods approved, deepened and widened her already acquired understanding of the horses. 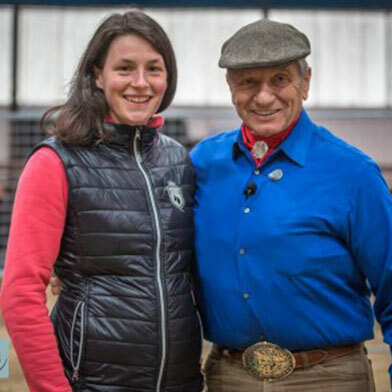 In March 2014 Lucia became a Certified Monty Roberts Instructor. 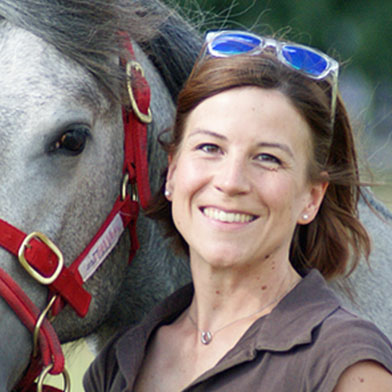 She lives in Marburg, in the center of Germany and works with young and problem horses and is looking forward to teach courses and sharing Monty’s methods.